The Scenic Rivers AHEC office is located in the scenic rural community of Cashton, Wisconsin. The northern portion of the region is known as “coulee country” for the many deep valleys that drain to the Mississippi. The economy is dominated by agriculture, including dairy, livestock and many small farms. The region includes two Ho-Chunk tribal communities, new communities of Latinos in areas with year-round food processing plants, and a migrant population during the growing season. Additionally, several enclaves of Amish are found within the region’s borders. The urban area of La Crosse has a growing minority population, particularly Latino and Hmong. Health professions programs in the area include the UW-La Crosse campus, with Public Health and Allied Health programs; two technical colleges with health professions programs; and a private college (Viterbo) with nursing program and dietetics programs. 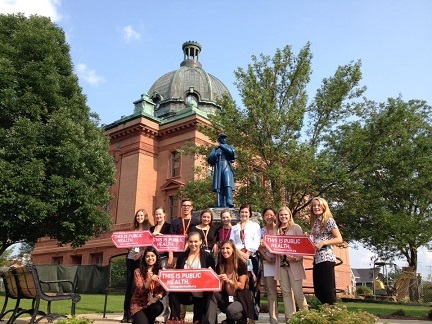 Several UW-Madison health professions programs also use clinical facilities in La Crosse and the surrounding area as their Western Clinical Campus. There are 17 rural health clinics and 13 Critical Access Hospitals in the service area, and one Community Health Center (Cashton) with two service delivery sites. The region also has a family practice residency program (La Crosse-Mayo) in La Crosse. The newly developed UWSMPH Wisconsin Academy of Rural Medicine program will be implementing a training site in the Scenic Rivers AHEC region. Buffalo, Crawford, Grant, Jackson, Juneau, La Crosse, Monroe, Richland, Trempealeau, and Vernon.